FRIO the world's first patented cooling wallet – Simply activate with cold water! – Light and compact – Reusable All FRIO wallets have been designed with our patented crystal technology to keep your temperature sensitive medication cool and safe. The Frio Skull Medication Cooling Wallet is perfect for a variety of different types of insulin pen, insulin vials or cartridges and auto-injector, making this particular FRIO ideal for those with conditions such as Diabetes, Rheumatoid Arthritis, Crohn's Disease and Anaphylaxis. With a minimum continuous cool period of 45 hours and a recharge time of under 5 minutes, FRIO is made for your everyday - wherever that might be! The Frio Skull Medication Cooling Wallet not right for you? FRIO comes in a range of different sizes, if you're looking to store something else inside your FRIO, just browse our shop or chat to us online to find your perfect FRIO. FRIO the world's first patented cooling wallet – Simply activate with cold water! – Light and compact – Reusable All FRIO wallets have been designed with our patented crystal technology to keep your temperature sensitive medication cool and safe. 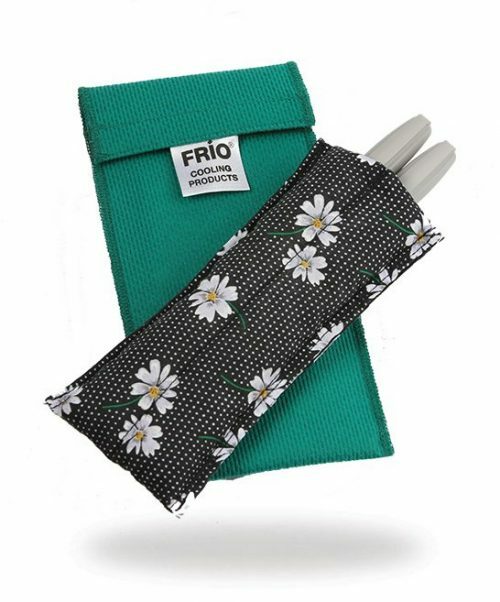 The Frio Daisy Medication Cooling Wallet is perfect for a variety of different types of insulin pen, insulin vials or cartridges and auto-injector, making this particular FRIO ideal for those with conditions such as Diabetes, Rheumatoid Arthritis, Crohn's Disease and Anaphylaxis. With a minimum continuous cool period of 45 hours and a recharge time of under 5 minutes, FRIO is made for your everyday - wherever that might be! The Frio Daisy Medication Cooling Wallet not right for you? FRIO comes in a range of different sizes, if you're looking to store something else inside your FRIO, just browse our shop or chat to us online to find your FRIO. Please note that this price excludes VAT and 20% VAT will be added at checkout. If you suffer from a chronic illness, you can claim back the VAT at checkout. The Frio Owl Medication Cooling Wallet; Keeping your medicine safe doesn’t have to compromise your style. That’s why we have launched our exclusive new collection of design-led FRÍO® wallets. FRIO the world's first patented cooling wallet – Simply activate with cold water! – Light and compact – Reusable All FRIO wallets have been designed with our patented crystal technology to keep your temperature sensitive medication cool and safe. The Frio Owl Medication Cooling Wallet is perfect for a variety of different types of insulin pen, insulin vials or cartridges and auto-injector, making this particular FRIO ideal for those with conditions such as Diabetes, Rheumatoid Arthritis, Crohn's Disease and Anaphylaxis. With a minimum continuous cool period of 45 hours and a recharge time of under 5 minutes, FRIO is made for your everyday - wherever that might be! The Frio Owl Medication Cooling Wallet not right for you? FRIO comes in a range of different sizes, if you're looking to store something else inside your FRIO, just browse our shop or chat to us online to find your FRIO. Please note that this price excludes VAT and 20% VAT will be added at checkout. If you suffer from a chronic illness, you can claim back the VAT at checkout. The Frio Dinosaur Medication Cooling wallet; Keeping your medicine safe doesn’t have to compromise your style. That’s why we have launched our exclusive new collection of design-led FRÍO® wallets. FRIO the world's first patented cooling wallet – Simply activate with cold water! – Light and compact – Reusable All FRIO wallets have been designed with our patented crystal technology to keep your temperature sensitive medication cool and safe. The Frio Dinosaur Medication Cooling wallet is perfect for a variety of different types of insulin pen, insulin vials or cartridges and auto-injector, making this particular FRIO ideal for those with conditions such as Diabetes, Rheumatoid Arthritis, Crohn's Disease and Anaphylaxis. With a minimum continuous cool period of 45 hours and a recharge time of under 5 minutes, FRIO is made for your everyday - wherever that might be! The Frio Dinosaur Medication Cooling wallet not right for you? FRIO comes in a range of different sizes, if you're looking to store something else inside your FRIO, just browse our shop or chat to us online to find your FRIO. Please note that this price excludes VAT and 20% VAT will be added at checkout. If you suffer from a chronic illness, you can claim back the VAT at checkout. The Frio Unicorn Medication Cooling wallet; Keeping your medicine safe doesn’t have to compromise your style. That’s why we have launched our exclusive new collection of design-led FRÍO® wallets. 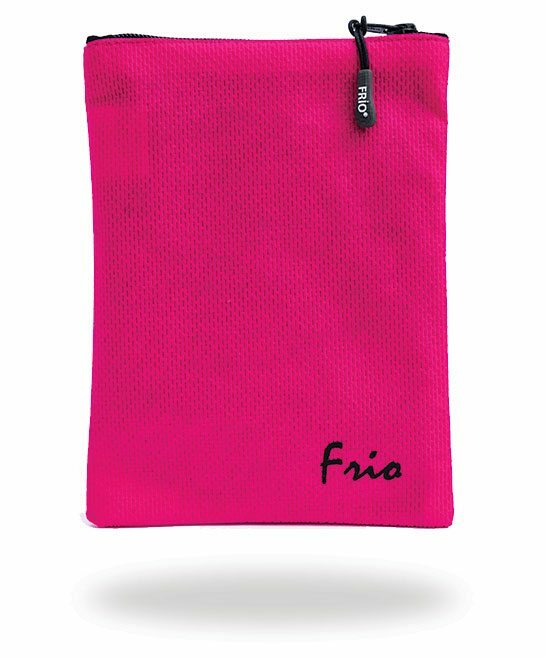 FRIO the world's first patented cooling wallet – Simply activate with cold water! – Light and compact – Reusable All FRIO wallets have been designed with our patented crystal technology to keep your temperature sensitive medication cool and safe. The Frio Unicorn Medication Cooling wallet is perfect for a variety of different types of insulin pen, insulin vials or cartridges and auto-injector, making this particular FRIO ideal for those with conditions such as Diabetes, Rheumatoid Arthritis, Crohn's Disease and Anaphylaxis. With a minimum continuous cool period of 45 hours and a recharge time of under 5 minutes, FRIO is made for your everyday - wherever that might be! The Frio Unicorn Medication Cooling wallet not right for you? FRIO comes in a range of different sizes, if you're looking to store something else inside your FRIO, just browse our shop or chat to us online to find your FRIO. FRIO the world's first patented cooling wallet – Simply activate with cold water! – Light and compact – Reusable All FRIO wallets have been designed with our patented crystal technology to keep your temperature sensitive medication cool and safe. 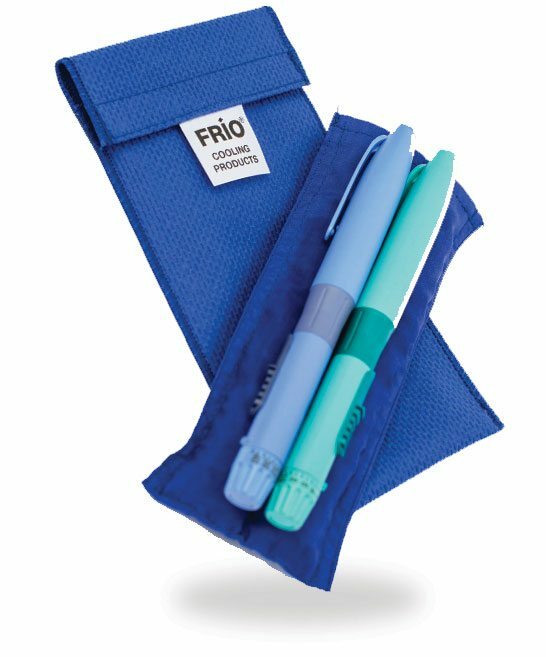 The FRIO Individual Pen Wallet is perfect for a variety of different types of insulin pen, or insulin vials and cartridges, making this particular FRIO ideal for those with conditions such as Diabetes. With a minimum continuous cool period of 45 hours and a recharge time of under 5 minutes, FRIO is made for your everyday - wherever that might be! FRIO Individual Pen Wallet not right for you? FRIO comes in a range of different sizes, if you're looking to store something else inside your FRIO, just browse our shop or chat to us online to find your FRIO. FRIO the world's first patented cooling wallet – Simply activate with cold water! – Light and compact – Reusable All FRIO wallets have been designed with our patented crystal technology to keep your temperature sensitive medication cool and safe. The FRIO Duo Pen Wallet is perfect for a variety of different types of insulin pen, insulin vials or cartridges and auto-injector, making this particular FRIO ideal for those with conditions such as Diabetes, Rheumatoid Arthritis, Crohn's Disease and Anaphylaxis. With a minimum continuous cool period of 45 hours and a recharge time of under 5 minutes, FRIO is made for your everyday - wherever that might be! FRIO Duo Pen Wallet not right for you? FRIO comes in a range of different sizes, if you're looking to store something else inside your FRIO, just browse our shop or chat to us online to find your FRIO. 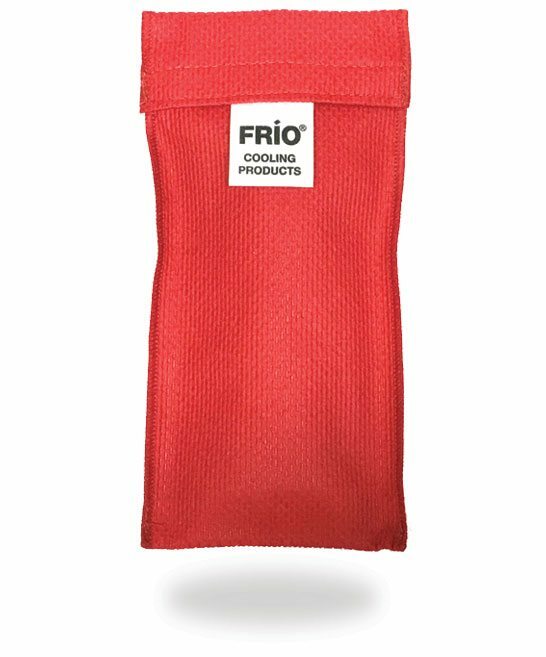 FRIO the world's first patented cooling wallet – Simply activate with cold water! – Light and compact – Reusable All FRIO wallets have been designed with our patented crystal technology to keep your temperature sensitive medication cool and safe. The FRIO Large Wallet is perfect for a variety of different types of insulin pen, insulin vials or cartridges and auto-injector making this particular FRIO ideal for those with conditions such as Diabetes, Rheumatoid Arthritis, Crohn's Disease and Anaphylaxis. With a minimum continuous cool period of 45 hours and a recharge time of under 5 minutes, FRIO is made for your everyday - wherever that might be! FRIO Large Wallet not right for you? FRIO comes in a range of different sizes, if you're looking to store something else inside your FRIO, just browse our shop or chat to us online to find your FRIO. FRIO the world's first patented cooling wallet – Simply activate with cold water! – Light and compact – Reusable All FRIO wallets have been designed with our patented crystal technology to keep your temperature sensitive medication cool and safe. Winner of the UK 2016 Outdoor Industries Product Of The Year Award, the FRIO Viva Zipper Wallet is perfect for a variety of different types of insulin pen, insulin vials or cartridges and auto-injector making this particular FRIO ideal for those with conditions such as Diabetes, Rheumatoid Arthritis, Crohn's Disease and Anaphylaxis. With a minimum continuous cool period of 45 hours and a recharge time of under 5 minutes, FRIO is made for your everyday - wherever that might be! FRIO Viva Zipper Wallet not right for you? FRIO comes in a range of different sizes, if you're looking to store something else inside your FRIO, just browse our shop or chat to us online to find your FRIO. FRIO the world's first patented cooling wallet – Simply activate with cold water! – Light and compact – Reusable All FRIO wallets have been designed with our patented crystal technology to keep your temperature sensitive medication cool and safe. The FRIO Extra Large Wallet is perfect for a variety of different types of insulin pen, insulin vials or cartridges and auto-injectors making this particular FRIO ideal for those with conditions such as Diabetes, Rheumatoid Arthritis, Crohn's Disease and Anaphylaxis. With a minimum continuous cool period of 45 hours and a recharge time of under 5 minutes, FRIO is made for your everyday - wherever that might be! FRIO Extra Large Wallet not right for you? FRIO comes in a range of different sizes, if you're looking to store something else inside your FRIO, just browse our shop or chat to us online to find your FRIO. Please note that this price excludes VAT and 20% VAT will be added at checkout. If you suffer from a chronic illness, you can claim back the VAT at checkout. FRIO the world's first patented cooling wallet Created and produced initially at the request of the International Glaucoma Association, these FRIOs are used around the world. – Simply activate with cold water! – Light and compact – Reusable – Includes a waterproof liner All FRIO wallets have been designed with our patented crystal technology to keep your temperature sensitive medication cool and safe. The FRIO Eye Drop 1 is perfect for a variety of different types of eye-drop medication, making this particular FRIO ideal for those with conditions such as Dry Eye, Allergic Conjunctivitis, Ocular Hypertension and Glaucoma. With a minimum continuous cool period of 45 hours and a recharge time of under 5 minutes, FRIO is made for your everyday - wherever that might be! FRIO Eye Drop 1 not right for you? FRIO comes in a range of different sizes, if you're looking to store something else inside your FRIO, just browse our shop or chat to us online to find your FRIO. Please note that this price excludes VAT and 20% VAT will be added at checkout. If you suffer from a chronic illness, you can claim back the VAT at checkout. FRIO the world's first patented cooling wallet Created and produced initially at the request of the International Glaucoma Association, these FRIOs are used around the world. – Simply activate with cold water! – Light and compact – Reusable – Includes a waterproof liner All FRIO wallets have been designed with our patented crystal technology to keep your temperature sensitive medication cool and safe. The FRIO Eye Drop 3 is perfect for a variety of different types of eye-drop medication, making this particular FRIO ideal for those with conditions such as Dry Eye, Allergic Conjunctivitis, Ocular Hypertension and Glaucoma. With a minimum continuous cool period of 45 hours and a recharge time of under 5 minutes, FRIO is made for your everyday - wherever that might be! FRIO Eye Drop 3 not right for you? FRIO comes in a range of different sizes, if you're looking to store something else inside your FRIO, just browse our shop or chat to us online to find your FRIO.